HOUSE opposition and administration leaders strongly backed yesterday the quest for more “greatness” in boxing history of Sarangani Rep. Manny Pacquiao by fighting with Floyd Mayweather this year as they rejected calls to suspend him for purportedly being inactive in Congress. House independent bloc leader and Leyte Rep. Martin Romualdez, Speaker Feliciano “Sonny” Belmonte Jr., Cavite Rep. Elpidio “Pidi” Barzaga Jr., Quezon City Rep. Winston “Winnie” Castelo, and Ako Bicol party-list Rep. Rodel Batocabe expressed support for Pacquiao’s possible fight to defeat Mayweather. “I would support another level of boxing greatness for Congressman Pacquiao. Congress will be very supportive of him to beat Mayweather in their much-awaited super bout. I appeal to please refrain from making any criticism against him about legislative work as he prepares for the fight. 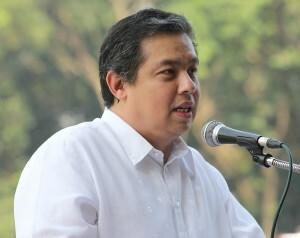 He is the source of inspiration and our national pride and his absence in Congress is very understandable,” said Romualdez, a lawyer and president of the Philippine Constitution Association (Philconsa). Lawmakers also rejected the call of former Sen. Rene Saguisag that Belmonte should suspend Pacquiao, also a playing coach of Kia Sorento in the Philippine Basketball Association (PBA), for making his legislative work as a hobby or sideline after only managing to attend 38 out of 69 session days during the First Regular Session of the 16th Congress from July 22, 2013 until June 11, 2014. Like Romualdez, Belmonte said he wanted Pacquiao to beat Mayweather as he vowed to excuse him from attending the plenary session. “I want him (Pacquiao) to beat the guy (Mayweather) and we will extend all the support he may need,” Belmonte, who is also a lawyer, stressed. Barzaga, who chairs the House committee on games and amusement, said Pacquiao should be given a leeway to prepare for the possible blockbuster fight with Mayweather. “Pacquiao should be given flexibility and latitude to ensure his victory against Mayweather, we hope that this blockbuster fight will happen this year,” said Barzaga, who is another lawyer. “He brings with him the hopes, dreams and aspirations of every Filipino anywhere in the world. For that alone, we can but forgive and understand Pacquiao why he cannot be physically present in Congress. Anyway, he has a staff which can adequately address the needs of his constituents while he is busy practicing for his bout,” said Batocabe.